In the run-up to the 52nd edition of the Munich Security Conference (12 to 14 February 2016) the MSC is releasing its second Munich Security Report (MSR) featuring important trends and issues in international security. Entitled “Boundless Crises, Reckless Spoilers, Helpless Guardians” the new MSR compiles data, analyses and maps which illuminate major developments and critical challenges to international security. 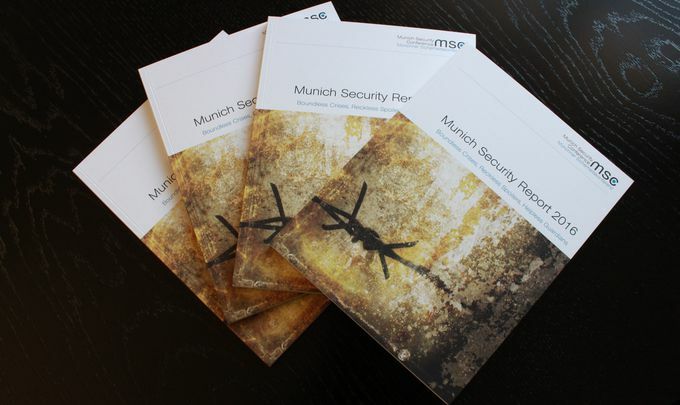 The MSR serves as a conversation starter for the 52nd Munich Security Conference (MSC) and as a background reading for MSC participants, but is also made available to security professionals and the interested public. New data from “The Military Balance 2016” by the International Institute for Strategic Studies show that those European NATO member states missing the 2% target spend an average of only 1.1% of their GDP on defense. These NATO members would have to increase their joint defense spending by an additional USD 97 billion to meet the target. IHS Jane’s data on the Russian state budget show to what extent the Russian public spending has shifted in favor of defense expenditures over the past few years. Graphics by the Mercator Institute for China Studies (MERICS) illustrate the ambitions of the Chinese initiative of a “New Silk Road” as well as China’s establishment of parallel institutions of global governance. Maps and analyses on the security environment in Eastern Europe assemble the most important military exercises and close encounters since the beginning of the Ukraine crisis. Data by the Armed Conflict Location & Event Data Project (ACLED) reveal a massive increase in jihadist violence across Africa since 2013. A large part of the victims can be attributed to Boko Haram, which pledged allegiance to the Islamic State in early 2015 and which, over the past year, was responsible for more victims than the Islamic State proper. Exclusive data by Airwars.org provide a detailed account of the number of airstrikes per member of the US-led coalition against the Islamic State, whereas an assessment by the Institute for the Study of War documents the targets of Russian airstrikes in Syria. Analyses by Chatham House in cooperation with the Bill and Melinda Gates Foundation and Merck illustrate the spread of the most recent pandemics and the increased danger they could pose for global stability. Download the Munich Security Report 2016 “Boundless Crises, Reckless Spoilers, Helpless Guardians” here. “Just like the MSC, which has successfully grown out of its original focus on defense, the report takes a broad approach to security. In addition to what you might expect to find in such a report, like analyses of Russian or Chinese foreign policy or the Syrian war, I was pleased to see that the report also looks at issues like refugee flows, health, climate change and cyber warfare.” – said former UN Secretary General & Chairman of The Elders Kofi Annan about the Munich Security Report 2016.